Delsey Paris Alexis is a three-piece hard shell luggage set of a 21-inch cabin bag and a 25-inch medium size and a 29-inch large suitcase. It is one of the latest release luggage sets by Delsey Paris and scores 5 out of 5 stars at the time of this review. 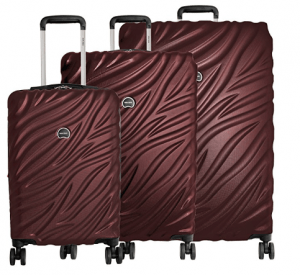 Delsey Alexis is offered in two color options of burgundy and navy, both of which are quite nice and with the same price tag as of today. As a color, Burgundy is more likely to stand out in a crowd of bags than navy on a luggage carousel at the airport. But the design is quite unique on the brand new Alexis set. The bags are made of solid and durable ABS plastic that will help with resistance to impact and better protection of your belongings. 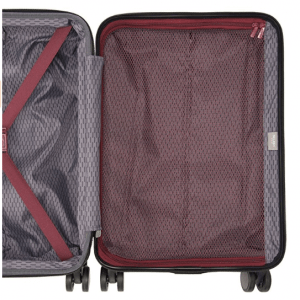 Each suitcase comes with four dual spinner wheels that will help you roll them easily and smoothly. These bags are expandable and with the zippers in the middle that you can unzip and gain additional space for storage. They are already spacious inside with mesh pockets and tie-down cross straps in the main compartment for better organization of your belongings and your clothes will not shift- will stay put. And this gives you a bit more flexibility overall. As you can see in one of the product photos the zippers can be interlocked to keep your stuff safe and to give you a peace of mind. Inside there is a large zipped mesh divider to offer you two different sections. The ABS material makes it both lightweight and sturdy, resistant to impact or any bad treatment or throwing around by the airline staff. And the beautiful grained texture not only looks good but also makes the bag resistant to potential scratches. Each bag includes a chrome locking telescoping handle for you to roll them easily on their four double spinner wheels on different grounds. You also have the side and top carry handles to be able to lift the bags horizontally or vertically comfortably especially when full and heavy. The Delsey Paris Alexis is not a low-cost set but you’re getting a very good quality product that is easy on the eyes and offers a great deal of flexibility and functionality to the customer. It looks and feels better than in the photos according to customers and can probably exceed your expectations. As a very good quality bag with a solid build, it should last well through several trips over the years. The shipping is quick via Amazon.com and you’ll get very good customer support if or when you need it. Please note that the 21” bag weighs 8.2 pounds, the 25” weighs 10 pounds and the 29” weighs 12 pounds. All Delsey suitcases come with up to ten years of warranty. But it does not cover mishandling by the airport staff, theft, exposure to extreme temperatures or accidents from the outside.